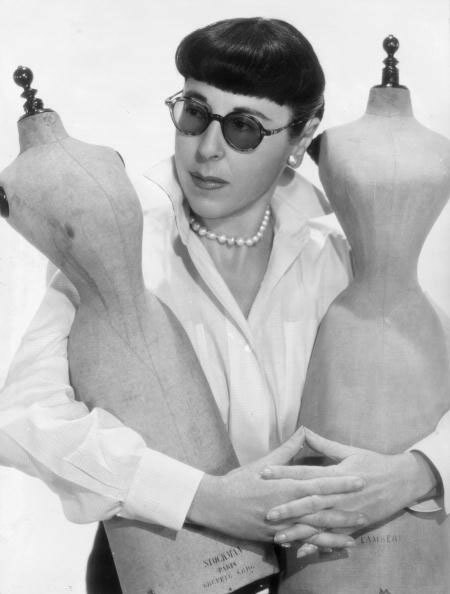 The legendary costume designer Edith Head loved to refer to herself as Hollywood’s “dress doctor.” Throughout her six-decade career, and in more than 1,000 films, Edith dressed up extravagant cinematic personas (Biblical seductresses, jungle princesses, showgirls, and cowboys) and yet she saw her task first and foremost as that of a roll-up-your-sleeves problem-solver: a curer of wardrobe ills, a soother of vexed brows, and a tamer of egos. 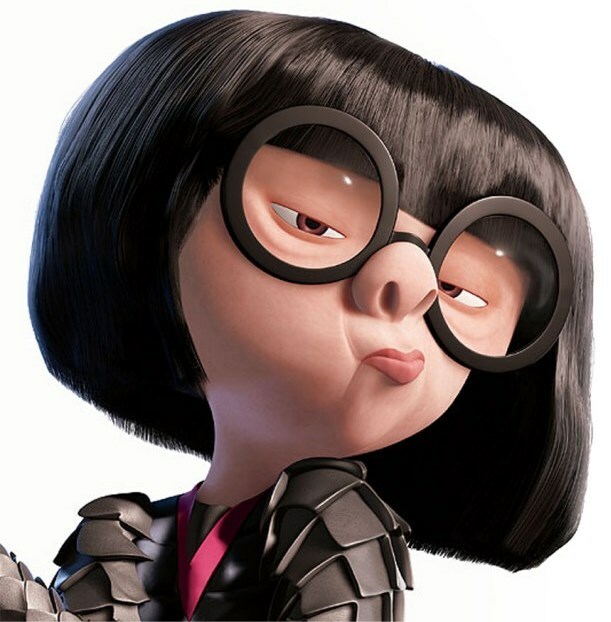 Edith was grounded and pragmatic, a shrewd politician and savvy businesswoman who not only operated an efficient “fashion clinic” at Paramount Studios (and later at Universal), but became a celebrity in her own right. Edith Claire Posener was born in 1897, in California. At the age of eighteen she graduates at the University of California, with honors in French after which she also receives her masters in romantic languages at Standford. Edith becomes a French teacher at the Hollywood School for Girls, where she meets the daughters of Cecil B. DeMille. Through them she occasionally visits the Famous Players–Lasky Studio to watch the grandiose director’s productions underway. She is an enterprising young woman and although her lack of experience, Edith soon gets duties in art instruction. (She secretly takes evening art courses at Otis Art Institute, and then at Chouinard Art College in Los Angeles). 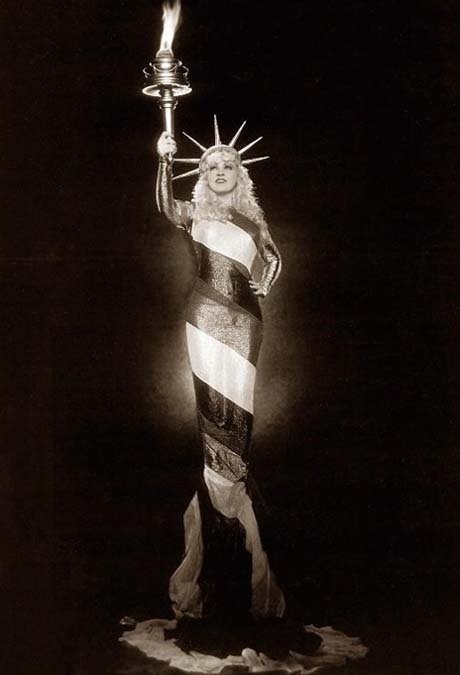 In the summer of 1923, she answers an ad in the Los Angeles Times for a costume sketch artist and is hired. (She feigns expertise in costume design by cobbling together a portfolio of drawings borrowed from her classmates at Chouinard.) Soon Travis Banton (wardrobe designer) also joins Famous Players-Larsky and becomes Edith’s mentor. The seem time she marries Charles Head, a salesman for Super-Refined Metals Company in Southern. Like so many in the image business, Edith succeeded through self-invention. For years, she liked to obscure the details of her less-than-glamorous origins. Luck strikes in 1927, when Travis Banton is named chief designer, making Edith his assistant. After designing countless wardrobes for the “B” movies and the Westerns, as well as the background characters, Banton assigns her to costume her first big star: Clara Bow, for the film Wings, the two women become friends. After the 1929 crash and the rapid fall of hemlines, Hollywood makes wants to establish itself—rather than Paris—as a trendsetting force. Various studios begin instructing costumers to produce original designs, rather than buying from the couture houses. Publicity departments begin promoting films as fashion spectacles. Edith’s contract is renewed, but her salary is cut by $25 a week. 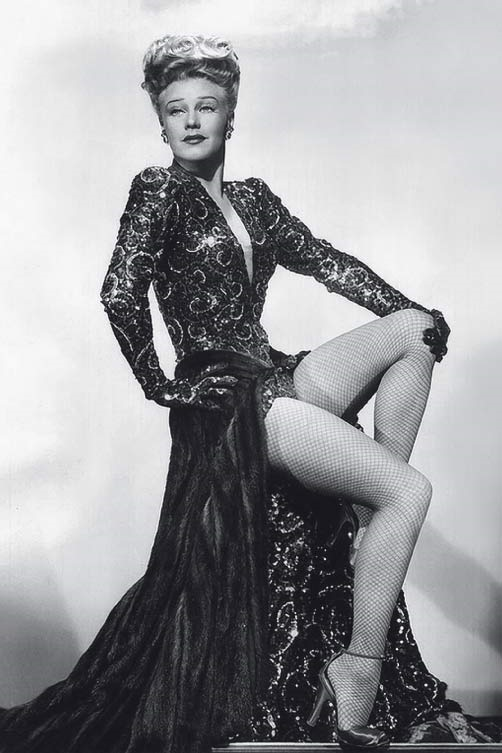 In 1933 she earns her first official on-screen credit, “Costumes by Edith Head,” when she outfits another celebrity, Mae West for her first headlining movie, She Done Him Wrong. 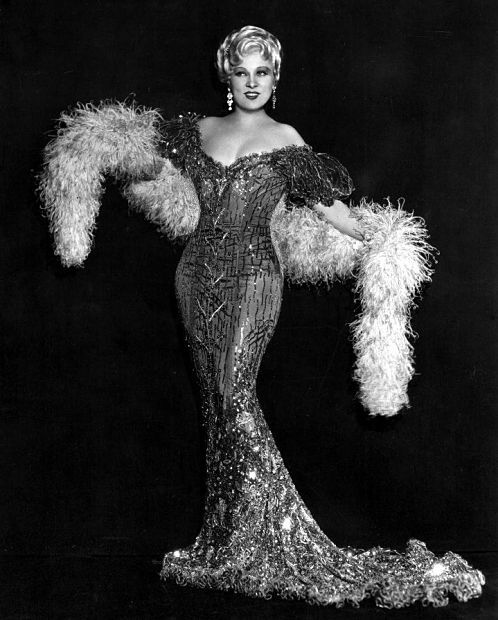 Mae West remarked ‘tight enough so I look like a woman, loose enough so I look like a lady.’ This statement became a style template Edith would adopt. 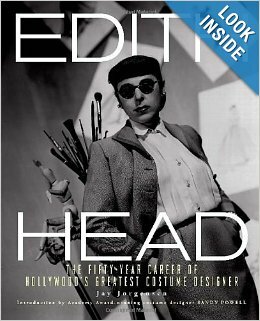 Edith is triumphing on for years, when, in 1938, she’s named chief designer at Paramount—the first woman to hold the job. 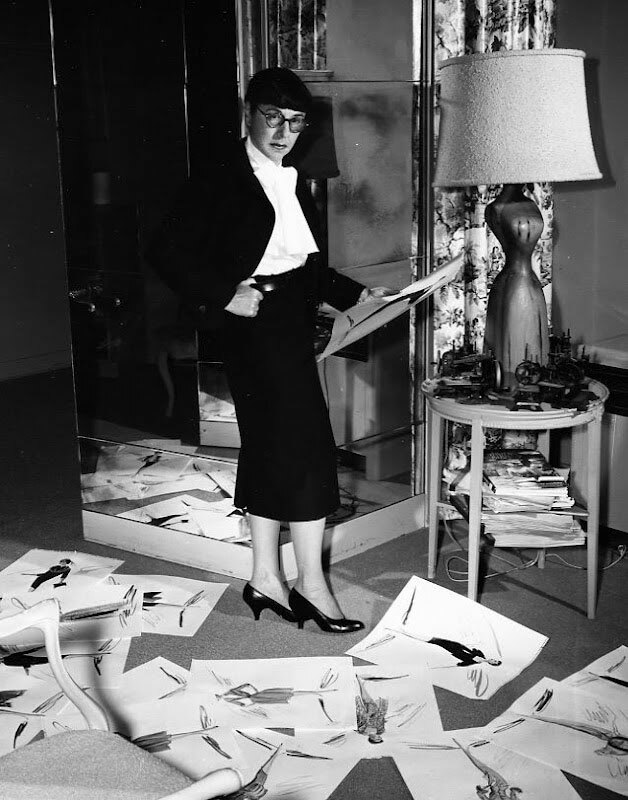 She gets a divorce from Charles Head and appears for the first time in Vogue, in an ad for Fashion Plate shoes, wearing a Louise Brooks bob; “Look for Edith Head’s autograph on the insole,” exhorts the copy. Also Edith will continue to contribute style tips in Photoplay for many years, to help sustain Tinseltown’s place as style arbiter. In 1940 Paramount, now producing 40 to 50 movies a year, brings in an impoverished European aristocrat named Oleg Cassini to apprentice with Edith. And in September she marries Wiard (“Bill”) Boppo Ihnen, a film art director. They will remain together for nearly 40 years. During WWII, Edith frequently makes statements to the press rallying women on the home front: “All designers are turning to cotton. Silk is out of style for 1942. . . . Double-duty clothes will cut down on budgets. Coats with zip-in, changeable linings and suits with reversible jackets are the fashion news. 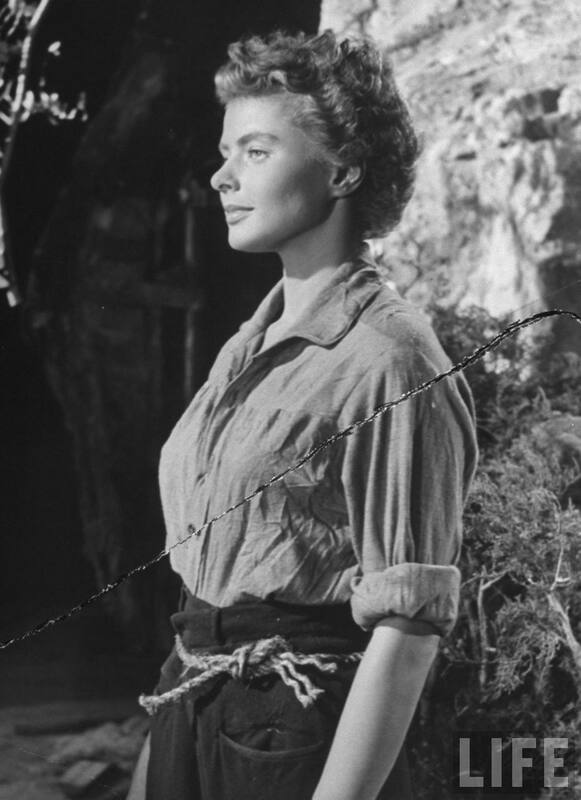 Edith designs the look for Ingrid Bergman in For Whom the Bell Tolls, 1944. 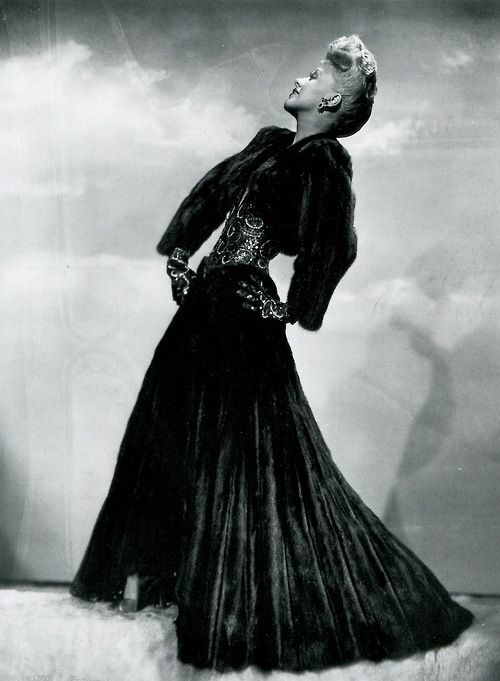 In 1947 Hollywood is shaken up by the Paris debut of Christian Dior’s shockingly opulent, lush-skirted New Look; many movies, mid-production, feature simpler straight skirts and narrower silhouettes. “Every film that I had done in the past few months looked like something from the bread lines,” Edith later says. “I vowed that I would never get caught by a fashion trend again, and became a confirmed fence-sitter. When skirts became full, I widened mine gradually. If lengths were at the ankle, mine were mid-calf. The result has been that if you look at my films it is very difficult to date them. The praise wasn’t unanimous, however. After Head claimed her sixth Oscar for the 1954 film Sabrina, rumors circulated that Audrey Hepburn’s striking black cocktail dress with bateau neck and bow-bedecked shoulder straps was actually designed by the Parisian couturier Hubert de Givenchy (Hepburn’s friend), while Head publicly took credit for it. Even after her death, former colleagues would claim that Head had no compunction about accepting plaudits for others’ work. All About Eve. Funny Face. Sunset Blvd. Rear Window. Sabrina. A Place in the Sun. The Ten Commandments. 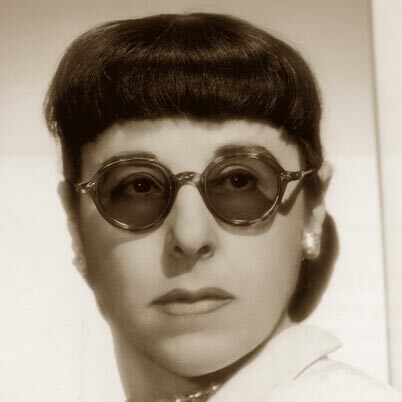 Scores of iconic films of the last century had one thing in common: costume designer Edith Head (1897–1981). She racked up an unprecedented 35 Oscar nods and 400 film credits over the course of a fifty-year career. 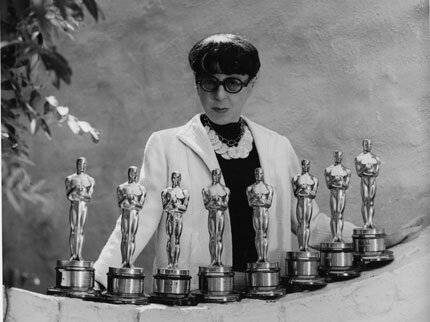 Never before has the account of Hollywood’s most influential designer been so thoroughly revealed—because never before have the Edith Head Archives of the Academy of Motion Picture Arts and Sciences been tapped. This unprecedented access allows this book to be a one-of-a-kind survey, bringing together a spectacular collection of rare and never-before-seen sketches, costume test shots, behind-the- scenes photos, and ephemera.